Have you recently felt obnoxious smells coming out from your kitchen? Of course, you don’t want that odour to linger in your house much longer. Be it home cleaning or commercial kitchens, any environment intended for food preparation must ensure illness-free conditions. But don’t trouble yourself cleaning them on your own. We offer you our utmost oven, fridge and deep cleaning services. Is your oven not heating fast enough? Or Is it smelly and smoking when you turn it on? And having a hard time to see through the oven door? Well, I’m afraid you might have a serious case of a dirty stove out there. Cleaning the oven is one of the most hated household chores. And believe me, there are more enough chores to do without having to spend hours pouring over a dirty oven too. Using a professional oven cleaning service can do you good. It is convenient, less hassle, and of course time-saving. And we at Maid in Perth are confident enough that we can provide you with the highest quality service you could ever receive. Our oven cleaning includes thorough cleaning of the trays and whole internal of the oven along with the Rangehood and all its internal items. Our cleaners only use effective eco-friendly and non-toxic cleaning tools. So, you have nothing to worry! Your newly cleaned oven will be ready again for the next use. An oven isn’t the only kitchen appliance that needs to be cleaned. Did you know that the fridge can be a home to cold-resistant germs? Different foods stored in your fridge can lead to the build-up of many bacteria. Notably, this is not only a health risk but it also generates an unpleasant smell. And sometimes the source of foul odours. Hence, regular cleaning is necessary to avoid all these things. However, defrosting and cleaning of your fridge can often be a messy and time-consuming task. So, treat your refrigerator to a professional clean without worrying anything! Our fully trained technicians will take out all removable parts and soak them in gentle detergents. Through our professional fridge cleaning services, we aim to restore your fridge to its shiny and clean appearance once again. By the use of eco-friendly, readily bridgeable and food safe cleaning product, rest assured your fridge is safe to use right after the cleaning. Kitchen deep cleaning means a total disinfection of your kitchen. Time to time, a house needs a heavy-duty, serious, thorough and detailed kind of cleaning. Not all people want to spend their precious free time cleaning kitchen cupboards, deep cleaning the fridge, cleaning the sink thoroughly, and etc. Our deep cleaning service can take good care of these kinds of kitchen cleaning dilemma for you. All you have to do is contact us for further details, have a quotation and book an appointment. Once everything is settled make a detailed list so you can know what to expect after the cleaning. Furthermore, if you are not satisfied with your oven, fridge and deep cleaning, we will come back and clean for no additional cost at all! But, if you are still not happy enough to recommend us, we offer a full refund. 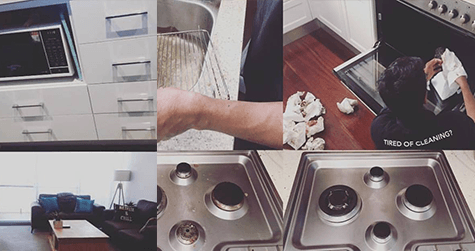 So, with Maid in Perth, you can be assured that you are getting a consistent, reliable, high-quality deep cleansing service that is environment-friendly at a fair price.